For Steve Springer, baseball has always been an issue of quality over quantity. Springer tried to make the most of his 17 major league at-bats with the Cleveland Indians and the New York Mets, and is now working with young players helping them to do the same. “If you know my story, I didn’t start in high school, I got three at-bats as a freshman in high school, and three my freshman year in college. I go around the country inspiring kids not to quit,” Springer said via telephone from his home in California. Springer has carried the message through his CD / DVD combo entitled, “Quality At-Bats,” where he breaks down the mental side of hitting into something easily digestible, all to develop confidence in players at all levels. The New York Times featured Springer earlier this year when New York Yankees top prospect Dante Bichette Jr., said that he listens to Springer’s CD every day on his way to practice and games. Major league superstars Jose Bautista and Mark Trumbo are among the many who also praise Springer’s message. How exactly is Springer going about changing the game with his program? It’s a paradigm shift aimed at removing the emphasis from one’s batting average, something he claims has destroyed more players’ dreams than the first time they saw a good curveball. “The batting average is the most evil thing in baseball; it destroys more young players than anything in the game. I did everything right but went 0-4. Why is that number so powerful?” Springer asked. Getting players to stay in the game mentally is tough, but it is something that he preaches to his students if they want to be able to put their best foot forward every time they step on the field. So how did Springer, who toiled in the minor leagues for 14 seasons, save for two cups of coffee in 1990 and 1992, keep his edge? Springer spent most of his career in the Mets organization, starting in 1982, the same year as Dwight Gooden. The second baseman began to hit his stride right in between the Mets two playoff runs in 1986 and 1988. Looming behind mainstays Wally Backman and Tim Teufel, there was little room for Springer to break through. “I thought I had more of a chance in 1987, I was in the top 10 in the league in hitting, but when Howard Johnson went down, they called up Keith Miller,” he said. Springer plugged away despite being overlooked, to the tune of almost 1,600 minor league hits. The Mets traded Springer away from the organization in 1988 but returned in 1992 after a brief call-up with the Indians in 1990. This time the Mets rewarded Springer for his perseverance. “[It seemed like] twenty guys got hurt. Willie Randolph got hurt, and I get called up for 10 days, I go 2-for-3 with a double in ‘Frisco, and I’m thinking, ‘Sweet!’ I got sent down before I put my hat in my locker. They tell me they’re going to call me up in five days,” he recalled. Somehow, fate was not too kind to Springer, who waited 11 seasons to get his shot in a Mets uniform. After a strong finish in AAA Tidewater, Springer hung around for the call. It never came. 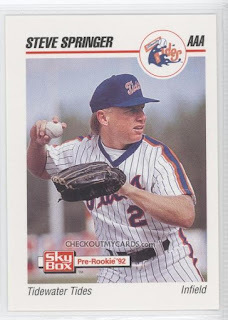 “I hit .290, got the Doubleday award [for] MVP of the AAA team, and then two days later, they trade David Cone to Toronto for Ryan Thompson, and some stiff named Jeff Kent. So I’m out, [because] they needed my roster spot,” explained Springer. He spent another three seasons in the minor leagues, retiring after the 1995 season. At least his brief journey with the team that drafted him ended on a high note. Springer’s career turned to scouting at the urging a close friend who was working with the Diamondbacks when he was contemplating if he should play one more year. “Luis Medina called me and said, ‘Your playing career is killing your scouting career. Then 30 minutes later, the Tigers called me up and offered me $5,000 per month and no big league camp. The previous year I was making $7,000, so I called Luis back up and he put my name in with the Diamondbacks and I went right in with them,” he said. He scouted for five years before becoming an agent for the next seven. He returned to the Diamondbacks in 2008 as a scout before the Blue Jays called. When he is not working for the Blue Jays, he travels the country giving what he calls, “The Mental Hitting Lesson.” The positive effects that he has seen from his CDs, talks, and seminars continue to drive him.